Edmonton is linked to continental and Asian export markets by two Class-1 railways – Canadian National (CN) and Canadian Pacific (CP). CN and CP operate approximately 7,000 route miles in Alberta and transport about 66 million tonnes into and out of the province. Major commodities moved by rail include agricultural products, petrochemicals, forest products as well as a wide range of consumer products shipped in containers. 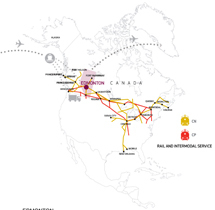 CN is North America’s only transcontinental network linking eight Canadian provinces, 16 American states and Mexico. CN’s Western Canadian network operations centre is located in Edmonton and provides direct service to both the Port of Prince Rupert and Port Metro Vancouver. CN’s Northern Line runs from the deep water Port of Prince Rupert through the lowest-grade mountain passes in the Rocky Mountains to Edmonton and beyond. Edmonton’s CN yards offer intermodal services from its northwest Edmonton site. 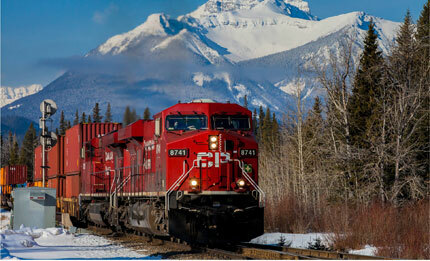 CP connects Edmonton to Canada’s southern trans-Canada route from Vancouver to Montreal and south to key eastern U.S. markets. CP services the intermodal needs of its customers from its south Edmonton site. Industrial and commercial shippers need direct access to intermodal container and cargo services. Both CN and CP railways operate intermodal container yards in Edmonton and both services are currently planning expansion. The Edmonton International Airport’s cargo park offers convenient access to two intermodal rail yards that provide inland and marine container service. Combined with an extensive network of highways, Edmonton keeps industry connected with raw materials – and customers.